1. Send a prank text to someone you know to say you’re bailing out on them. Your excuse? You’re off on a last-minute trip to Cuba! 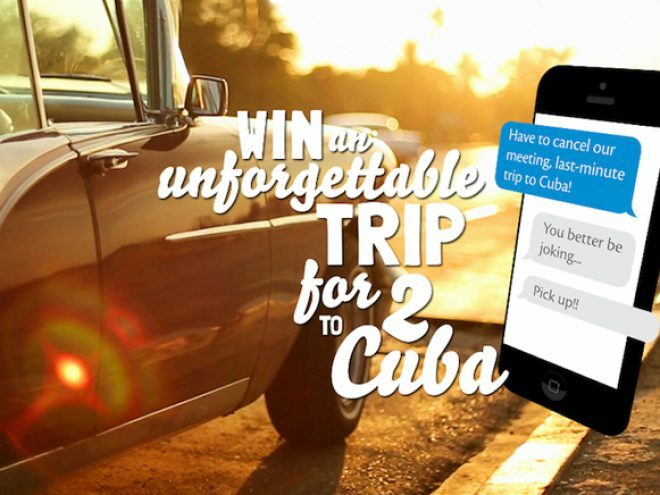 •	Upload your screenshot via www.cubatravelnetwork.com/competition. •	Tweet it using the #submitctn. •	E-mail it to competition@cubatravelnetwork.com with “Submit CTN” as the subject. 3. Share your prank to collect as many votes as you can. The prank with the most votes wins a definitely different experience.